Repetition has always seemed to have a bad reputation. When I was younger, practicing the same thing over and over was not appealing to me. As a teacher, I find my students often feel the same way. I have learned, however, that repetition is the single most powerful tool we have to improve our skills; whether it is staying financially or physically fit, or becoming great at…well…anything. 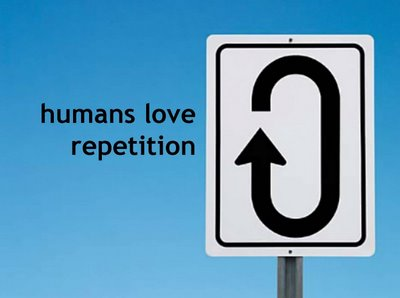 Repetition has proven to have incredible effects on the brain. It makes our “wires” stronger, faster and more accurate over time. To embrace repetition, we have to change our mindset. We need to love repetition; it’s not a chore, it is the most crucial weapon we have to be great at something. From a distance, athletes like Tiger Woods and Michael Jordan, or musicians like Joshua Bell appear to lead charmed lives. They created that charm. If you rewind the clock and look closer, you will find that they spent (and still spend) enormous portions of their time intensely practicing their craft. Tiger still hits hundreds (thousands?) of balls a day, every day of the week. Jordan to this day practices daily with the young pros in the NBA (rumor has it he may make a return to the NBA at the age of 50. That is due to hard work…not genetics). Josh Bell still practices 4-5 hours a day. If you want to get out of debt, you need to roll up your sleeves every day and embrace the repetition of being frugal and not spending. If you want to get in amazing shape, you need to embrace a “blue collar” attitude and wake up and go to work every morning…whether you want to or not. If you want to be great at anything, there is good news: There are no “chosen ones”. Brain study is what it is; it has proven what we must do to create greatness in ourselves. If we try a little every day to embrace repetition, it will slowly but surely become a habit, and we will get better at whatever we choose to do. So stop waiting for inspiration, go get your hands dirty, and wash, rinse, repeat! You may know by now that this blog has been nominated for one of the Top Personal Finance Blogs of 2012, sponsored by One Smart Dollar and Ready for Zero. I would be honored if you took 10 seconds to click here and vote for me! Thanks as always for reading!